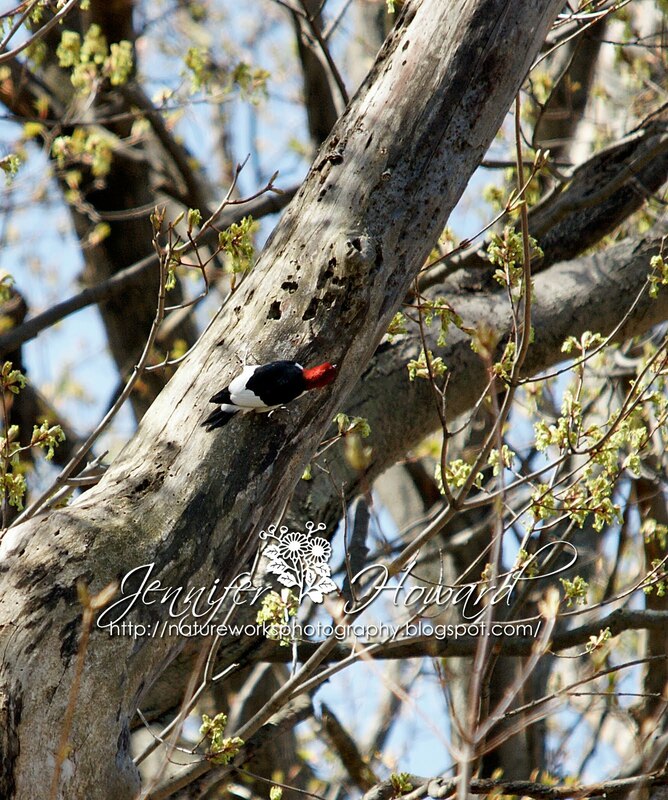 May 15th,the pair of woodpeckers were in my yard. Both at the same time which is unusual as far as getting them close enough to actually get a photo. So this was a very good day with the pair. As you can see by the one photo of it up in the tree. It was a cool day. Feathers were all fluffed up. Probably wishing it was still south. This has been a late spring and weather is up and down like a yo-yo tempurature wise. Very unsettling for the birds who are arriving back and also for the birds already nesting. Today the red headeds were here quite a bit. Still calling and chasing. 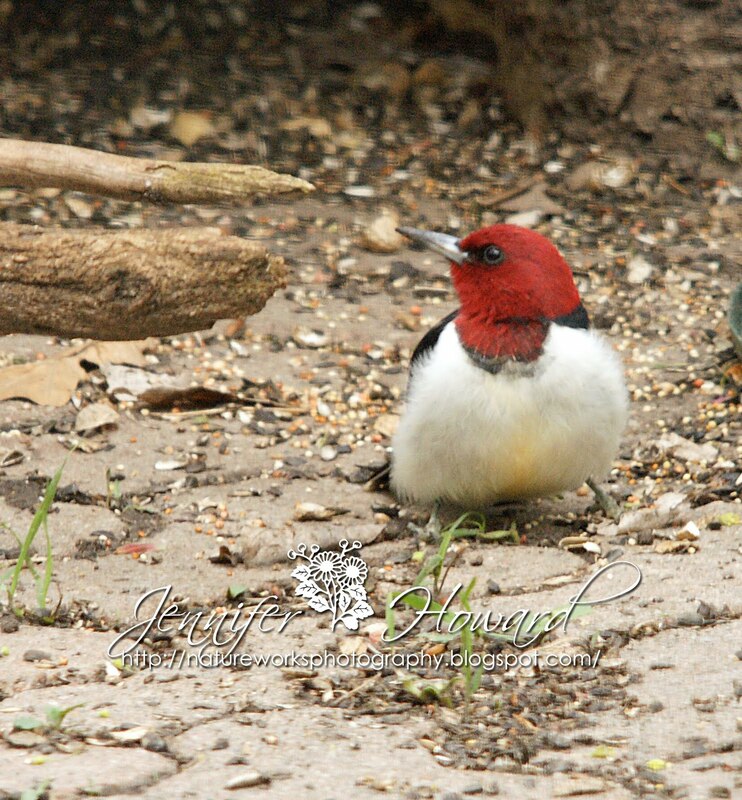 Came to peanuts feeder through the day and were both in the feer area in the backyard habitat together. They were on the ground eating seeds and one was on the shelter cover checking out it's mate below. They stayed there for a while before flying off. 2011 Red Headed Report Begins. I was starting to get a bit concerned about thered headed woodpeckers. They ahd not arrived back. Then on the morning of May,11th. I heard that familiar calling. There back. Both have arrived together like last year. They are calling,chasing each other. Was a wonderful sound to my ears. They came to the peanuts a bit and were very busy. There 2011 journey has begun. Lookin good!! Have a pair nesting in a tree out back. Busy feeding young in the nest. Young are out in maple tree out front. 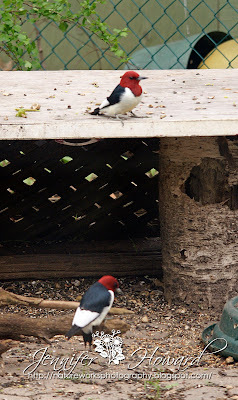 Have 3 young red headed woodpeckers with mom & dad. Young are learning to peck. young getting more independent every day now. Sept. 4th. Last day I saw this family. They have moved on. 2 adults arrived back today. 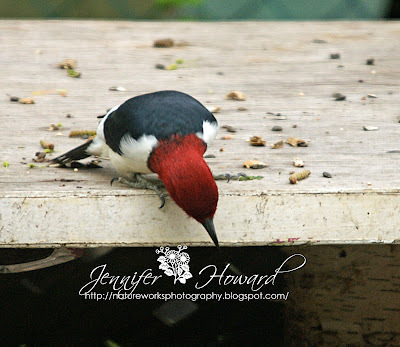 May through June we had the woodpeckers at the feeders. This year we did not have any young woodpeckers here! NO RED HEADED WOODPECKERS SEEN. Seen in the Big Bay Point Marina. 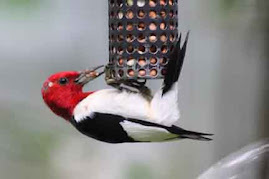 1 here at the feeders. 1 sitting in our front maple tree. Not much happening this year either with them. Are around though. But not here. We have 3 here this morning. Drumming and chasing each other around. A lot of commotion. Amazing displays. 2 have paired off. Still doing the mating ritual. 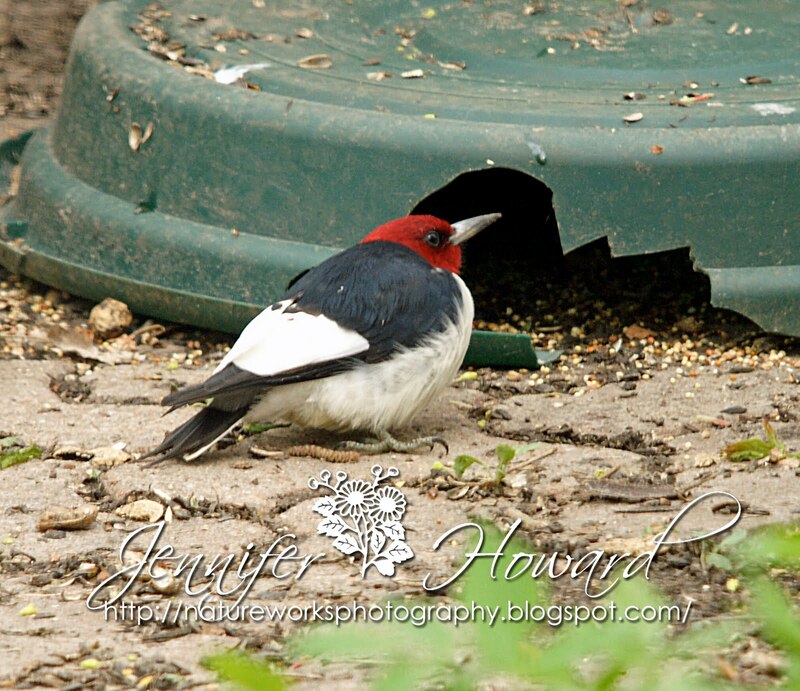 1 is coming to the feeders. Still 3 birds here,2 are definitely paired off and the 3rd is still chasing around with them. The pair have started mating today. We have 1 bird here. No sign of young ones yet. I am getting the adult here very frequently to the feeders. Around 7pm. Looked up on the dead branch above the garage. 1 red headed baby here. Adult feeding it. Within a few min. Adult flew and baby followed. Then we heard a ruckus out back. Other adult and 2 more babies. 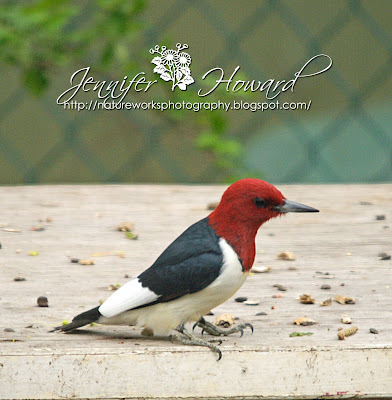 We have 3 young fledgling red headed woodpeckers here. Pileated,common nighthawks flying over and our red headed family. 12:30 am Heard a screech owl out front. Young starting to eat on it's own now. Still being fed as well though. Out on the road we had 100 plus monarch butterflies all over the road in front of the house and up & down the street. Whole family here feeding.Young really coming along. My red bellied showed up today at the same time as red headed. 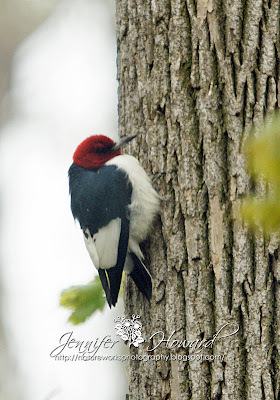 Red headed got very upset and took after the red bellied woodpecker. It was a battle in the air. The red bellied left. 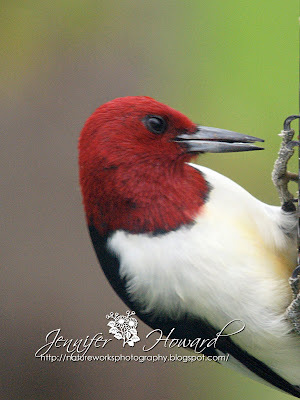 Red headed was very dominant. I have our family here and another bird has shown up as well. It is tagging along with the family. 1 adult up the street. A young one showed up at the feeder this aft. Not feeding here as much last few days. 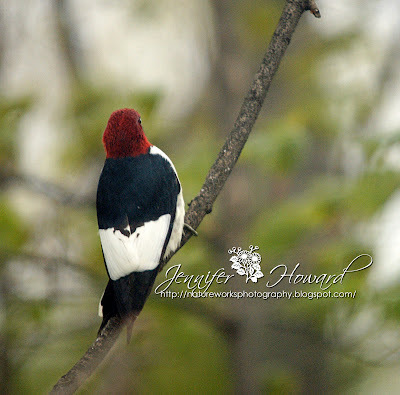 1st time in 2 days I'm hearing the red headed woodpeckers. Very late as a rule they are gone by now. Have 1 adult here. 1 young red headed feeding at the house. Here daily during the month of may. Am hearing the red headed's up the street calling. 1 at the feeder here often. I think they are feeding nestlings now. 1 adult here a lot. Feeding a lot now but no sign of wee one's yet. Again around 7pm I heard a high pitch squeaking in the same branch above the garage. 1 young red headed being fed. Young have arrived! Other parent arrived with other 2 fledglings. We have a confirmed 3 young again this year. Although still being fed,1 young is starting to feed on it's own as well now. Whole family here today at the feeders. 1 adult up the street. Young one here around 6:30 at feeder. 1 adult and 1 young here. FAMILY HAS MOVED ON SEPT 4th. We have 2 adults back. Pair is all over the place calling and chasing. We have a 3rd one here now. 3 still here. Other one I believe to be one of last years young. Parents are tolerating it. 3rd one comes to feeders and flies off in the marina direction now. Other 2 are still calling and chasing. Both parents feeding at feeders at the same time at 7:45 pm. Have 3 peanut feeders out this year. Red headed adults are drumming & calling all over the place. Around the house,up the street. Have seen 3 but am hearing 4. I thought I heard the high pitch of the young as well. Later in the day both parents at feeder again at the same time. Packing their bills full and flying off. Are feeding young. This morning seems very busy at the feeder. 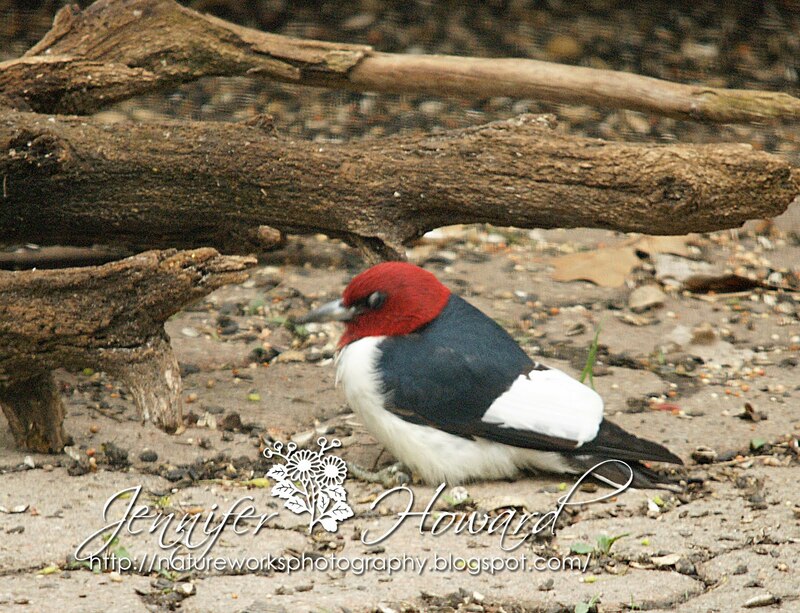 Red headeds are actually waiting for the feeder. Parents chasing and calling again. 1 fledgling at the feeder at 7:30 pm. It was trying to feed on it's own. Having a heck of a time but finally did get a taste and was licking it's bill. Thoroughly enjoyed it's taste of peanuts. So cute. It seems 7:30 is a prime time to bring in the young for the first time!! 3 adults chasing again. 2 young one's trying to keep up. 1 went into a tree and seemed to be playing with an acorn. Parents seem to be leaving the young for a while now. Young are happy in the trees and keeping themselves amused. 2pm. young started getting quite vocal. 2:07 parents arrived and fed. 5pm. adult brought 1 young one to the feeder. both young going to feeders with parents now. Flying around chattering. Here mostly in the morning and afternoon now. 3-4 being prime time. Both young here at the feeder together. Whole family heard around the point but did not see them at the house. Hearing around the point again. Here for a short while in the afternoon. LAST DAY HEARD. Have moved on. Both joined up immediately and were bonded right away. Male actually digging out a nest cavity already. A 3rd adult showed up . More chasing and vocalizing. Both in a wooded area up the street. 1st hole was rejected by female and male is digging out another one one the other side of the same tree. Female is staying very close while he is excavating. By days end he was right inside. Female going right into the nest now. Male close by. They flew into the wooded area and returned. Both went inside the nest. They then came outside and sat. They then mated outside the nest cavity. They then mated again and the male chased everything away. Female in & out of nest today. Went into the woods and came back and mated a second time. 1st egg laid according to my records. Female now inside the nest. She only leave when her mate relieves her. Then she sits outside and preens. Seems to be scratching a lot too. She will sometimes go off for a few min while the male sits on the egg. 12-14 day incubation by both parent birds. A 3rd adult has showed up again. Feeds at the feeders and goes off towards the marina area. All eggs should be laid by now. Always one bird inside. Both parents inside the nest. Always one adult in the nest. Feeding a lot. Back & forth with food frequently. I believe 1 nestling has hatched. Male went in and his tail was sticking out. Then took off again. Feeding young in the nest. At the peanut feeder frequently through the day now. Can hear the babies crying for food now. Sounds like 3 maybe 4.I notice now the adult male has a scar on his head. Right side behind his eye. Watched the nest from 9 am - 10 am today and no parents. Babies crying. Starlings at the tree. Starlings kept peeping inside and nestlings jumped at them mouths agape. I was very concerned for the young ones. I think because the nestlings were so feisty and hungry that made it difficult for the starlings. Young nestlings went right after the starlings with mouths open wide. After that parents fed every 15 min. 1 nestling pooped it's head out of the hole briefly. 1 nestling pooped it's head out this morning and looked all around. Parents feeding a lot now. Parents perch on the outside of the nest now and feed through the hole. 1 nestling out and checking everything including me out. Other young are jumping at parents for food. Another bought with the starlings. they backed off and went inside and were quiet. But each time the starling peeped inside. They charged at it for food. Parent arrived and the starling quickly retreated. Parent very vocal when it came back. 1 nestling had it's head and shoulders right out of the nest hole. Another nestling is literally launching itself at the parent when food arrives. Parents feed heavily before the storm. All is quiet then. Parents feeding every few min's now. Spiders,moths,etc. Food getting bigger and more plentiful. The oldest nestling sits very quietly after it's fill and watches me licking it's bill after it's tasty meal. Parent finally get a short break. Older nestling is half out of the hole now while other fledglings are bouncing around inside. Nestling in & out of the hole this morning up to its' mid body. Chattering away now instead of the high pitch squeaking. I can see it's feet hanging onto the entrance. Almost fell out a couple of times. It walked around the tree. Peeking into the hole a couple times. It walked up & down a bit then flew into the woods. We could here it calling. Last couple days the parents have not been at the feeder as much. Nest appears to be empty. I here a chattering out by the garage,same dead branch. Adult with 1 fledgling in the trees. Young seems to be getting bugs from the bark on it's own while waiting for the parent to return with food. It flew to a wire. Mom came to it with food and it almost fell upside down. Loosing it's balance. It hung there while Mom looked on as if to say. What are we going to do now!! Was quite funny to see the dilemma. Baby finally flew to the tree and Mom followed it to feed it there. Both young here for feeding now. 1 young here at the feeder with adult and the other waiting in the trees for food. High pitch squeaking always gives them away. Baby at the birdbath this morning. Never see them go there. And never have seen it since for that matter. Parent joined it for a drink and a rest. Photo's taken. We have 5 red headed woodpeckers here. Chattering,chasing,drumming and vocalizing. I am guessing the young are learning from this adventure. 1 sits in the trees while the other one joins in the fun and games. !st day I have actually seen the 2nd fledgling. Until today I was hearing it but had not seen it. 1 young is obviously smaller than the other one. Squeaking while the other is chattering. But doing well. Have not had the 3rd adult in a couple days now. 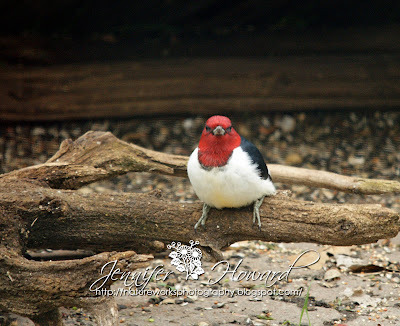 Today we had red bellied and red headed here together. 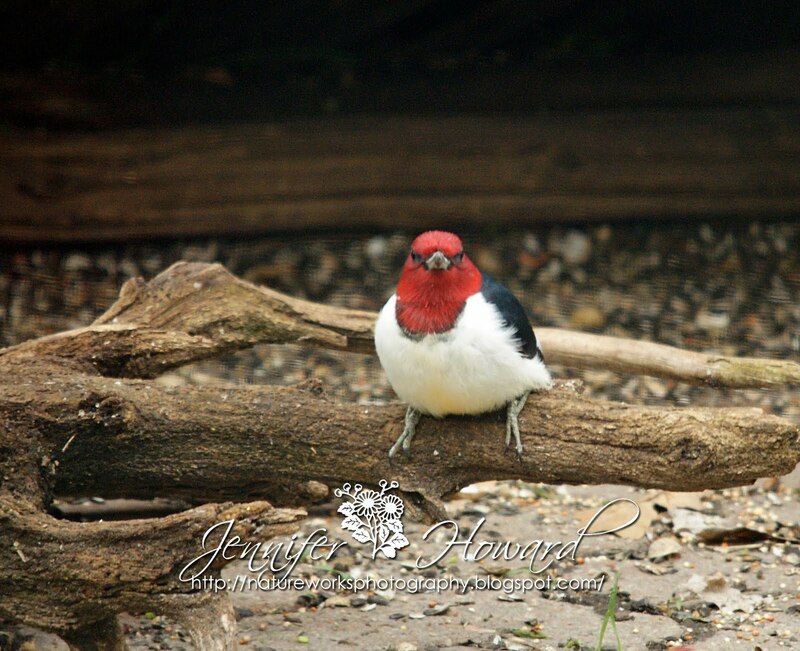 Red headed has always chased off red bellied. But have put more feeders out this year and it has paid off. Seem to be getting along. 1st young seems to almost be feeding on it's own. 2nd is being fed all the time still. 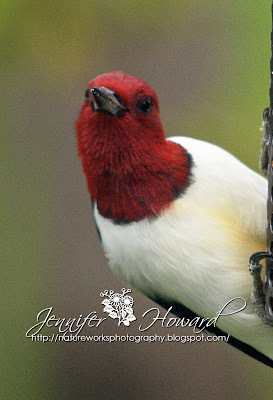 Heard calling, not 10 ft. from me as I was watering the garden was the young red headed at the feeder. Both parents were close by with other young. THEN a 3rd young one showed up and flew to the other 2. My calculations were right. They had 3. This last one follows Mom everywhere. And is squeaking,and being fed. The reuniting of the 3 siblings was really something. 1 young is feeding all on it's own now. All feeding independently now. But youngest still being fed on the side. The oldest I call Chatterbox. He chatters all the time and seems ticked off at the world. 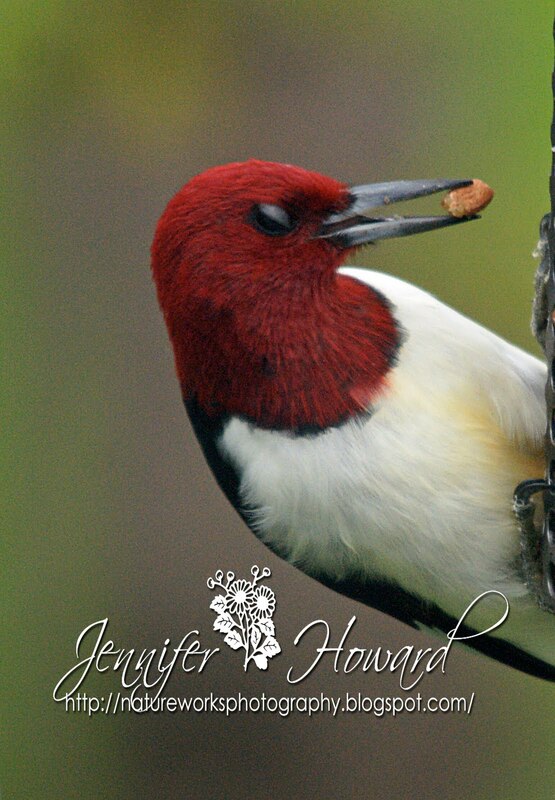 His chattering attracted a female hummingbird and a couple of young orioles today. Probably curious to his actions. He chatters and bobs his head up & down. Very cute! 2 of the young here bright and early. Chatterbox doing his usual and they seem to be displaying to each other. Have not seen 3rd fledgling since Aug.16th. It is out there with it's Mom. I can tell Mom & Dad apart by Dad's scar on his head. Other young still at feeder but is still being fed too. 2 young with Dad and going to feeders on their own. SEPT.3rd.LOOKS LIKE THEY HAVE MIGRATED EARLY. Both male and female arrived together. Went right to nest cavity in tree out back by our pond area. Red bellied worked hard on that nest but starling cased them out. A lot of drumming going on at the nest cavity here. This is not the same pair I have had here for a few years. But I think one of the young from a couple years ago. Was over by the marina area and heard the pair over in that area calling and chasing. They have nested in there before. I was at Andersen's cottage.I heard them other side of the road right in marina property. Heard the chattering in the big maple tree. Haven't seen for a while. Coming to feeder daily now. Here daily but now leaving with food. Heading towards marina area. Here feeding daily and leaving with full mouths. always in same direction. A lot of calling up the lake but not seen here. Calling to each other up & down the street. No young seen yet. Heard chattering this morning and chasing this afternoon seeing them up high in the trees. Were here later in the day at the feeders. Jeff saw 1 young one out back. Then I heard the young high pitch squeaking out front to. There are 2 fledglings. Feeding young up in the trees. They do not seem to want to be together at all. Sibling rivalry. Female has joined the male this morning. Possibly a 3rd young one. All are chattering. But 1 squeaking in the trees now. They have not come down yet. Lynn a friend has reported seeing 1 adult and 2 young at her house over in the Guest road area. About 2-3 km up the road. Family all calling to each other in the back in the wooded area. Could see them flying from tree to tree. Went out kayaking and could hear them all the way up to Bear Point. Still here,but not coming to the feeders at all. 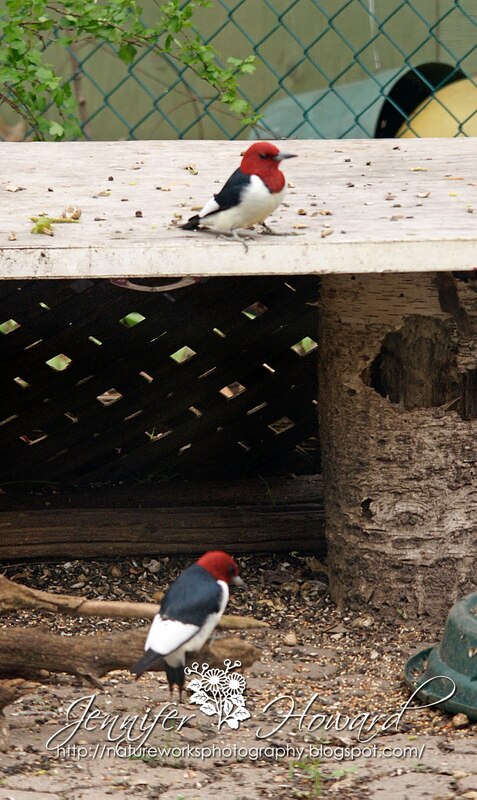 As you can see we have had the red headed woodpeckers here since 2001. And I have been able to successfully follow them almost every year. I feel they are declining due to habitat loss. They are on the species at risk list. If you need to take down a dead tree. Leave a 20-30 foot stump for the woodpeckers. They are loosing their trees so quickly. And they need dead trees to survive. We can help them but not cutting trees down and preserving the forests. 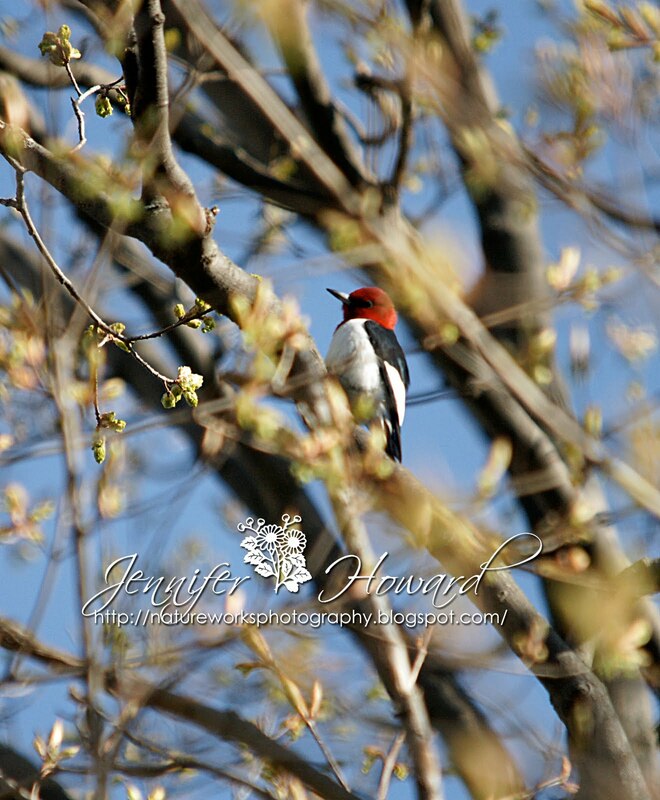 May 12th the both red headed woodpeckers arrived together. This is the male I believe. I did not get them together. The were very flighty and did not stay around long. This was a different pair than the last few years. I believe it to be one of my original pairs siblings from 2 years ago. It was here last year but kept it's distance from it's parents when they were nesting. Although they never seemed to mind it at the feeders when they were here. This pair did not stay long and I did not get the opportunity to photograph them as I did the last pair. The original pair never did show up for whatever reason. After having them for so many years it was sad without them here this summer. 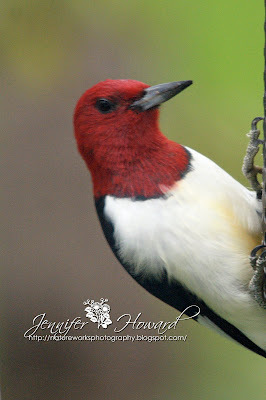 I never did see the new young red headed woodpeckers at my feeders. It seems they picked a newer territory to feed in this year. Parent was here and fed them here but they did not come in themselves.